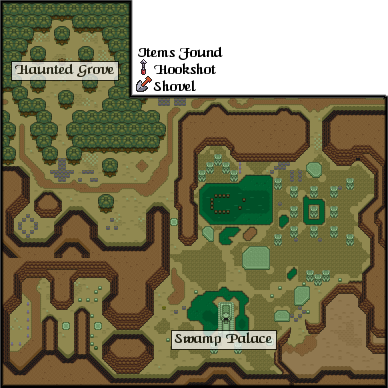 Many areas near the Swamp Palace are closely tied to areas in the Light World. By warping from the Dark World while standing within the stake boundaries in the southwest or in the circle of bushes south of the Haunted Grove, adventurers can explore high elevations in the Light World. The Plains of Ruin and the marshes surrounding the Swamp Palace are populated with several kinds of evil creatures. Adventurers report sightings of bomb-flinging Zirros, Rupee-snatching Pikits and other swamp-dwellers. They are mean-spirited but weak. Most explorers can defend themselves with a standard sword and shield. The legendary Flute Boy of the Haunted Grove often played music near his Light World home. The Flute Boy is said to have been able to communicate with animals by using his Flute. He could even call a feathered friend and hitch a ride to anywhere in the land. 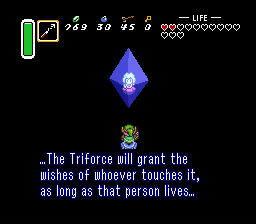 When the Golden Power of the Triforce attracted the Flute Boy to the Dark World, though, Ganon transformed him into an animal so that he could never play the Flute again. 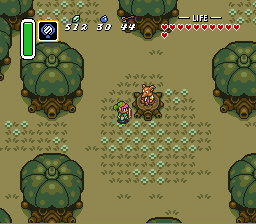 Upon telling his story to you, the Flute Boy gives you a Shovel so that you can find and use the Flute Boy's buried Flute. In the Haunted Grove of the Dark World, you meet a creature who gives you a shovel and tells you how the boy had been placed under a spell. The Flute, says the monster, must be found if the spell is to be broken. You must dig around the Light World's Haunted Grove in order to find the Flute. (It can be found in the upper-left corner of the Grove). Once you collect it, head to Kakariko Village and visit the weathercock near the center of town. Use the Flute, and the once-lost Duck will return to life. 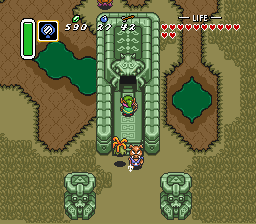 The Duck, when summoned by the Flute can carry Link to one of eight sites around the Light World. Each site is numbered on your Overworld Map. The area near the desert can only be reach by Duck-transport, and the other areas become more easily accessible. 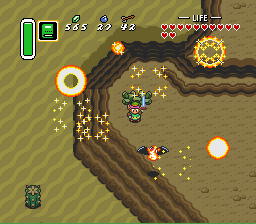 The spell of Bombos Medallion has no special purpose in Link's quest such as opening a dungeon, but it is useful in battle. Obtaining the spell, however, isn't easy. You must warp from a patch of ground at the east end of the Dark World canyon using the Magic Mirror. In the Light World, that patch of ground is on top of a cliff. Once on top of the cliff, you can reach the Mudoran monolith that holds the spell. South of the Haunted Grove in the Dark World, you will find a circle of bushes. If you stand in the center of them and use the Magic Mirror to warp back to the Light World, you will find yourself high on a ledge that was previously unreachable. There is a cave perched on the ledge that you can now enter. Inside, you will find a Piece of Heart. When explorers enter the Swamp Palace, they are unable to cross the empty indoor canal because of its steep, sheer sides. The key to getting to the other side is understanding the connection between the Light and Dark Worlds. Standing just outside of the place, you can warp to the Light World Watergate and pull the switch inside, allowing the water to flow. Then return to the Swamp Palace in the Dark World and swim across the water-filled canal. Provided that you've pulled the switch inside the Watergate, you should be able to swim across the canal to the cropped ladder on the left that would be otherwise unreachable since it doesn't drop all the way down to the floor. The buoyancy of the water will help you climb up and out of the water. On the other side, you'll enter a shallow pond with water-skating bugs known as Hobas. They are easy to defeat, but they dart quickly across the surface of the water. 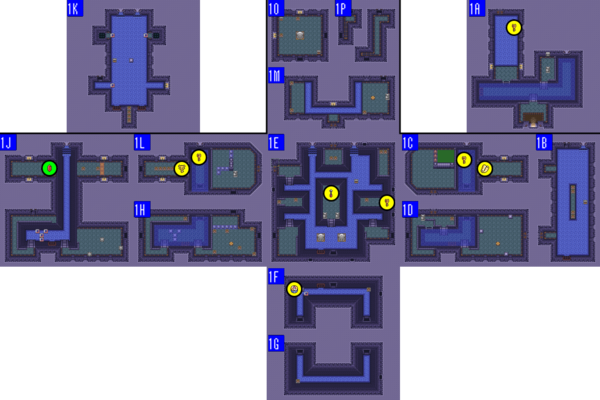 A chest in the water contains a Small Key with which you can open the door at the far end and descend down the steps to room 1B. If you entered this room from room 1B, you can collect the map. You must pass two red gelatinous Zols. Open the chest to received the Map. If you entered the room through the bottom level of room 1D, all you need to do is run up to the skull and collect a Small Key and return to 1D. Then you will come back through the unlocked door at the top. You must deal with two Stalfos before utilizing your hammer to knock down the bobbing pegs into the floor. Once you create a pathway to the lever, stand to the right of it, and push it left. The lever should move and water will flow into the canal in the center of the room, and flow into 1D as well. 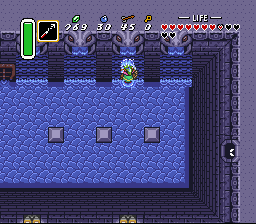 You can bomb the left side of the wall of this room to enter the upper-right corner of room 1E, but all you will find are Rupees and Bombs. When you enter the room, there will be a few enemies assembled, including a red Stalfos, a red Bari, a blue Bari, and fire chain known as a Winder. You can't defeat the Winder, nor can you defeat the fallball shooting trap in the center of the floor. Climb down the into the canal and enter room 1C through the open door to collect a key. Return back here, and climb up the ladder on the opposite side to unlock the door and enter the high part of room 1C where you will be able to throw the level which allows water to flow through the canal. Once you have the water flowing, return here and jump in the water. You will now be able to reach the cropped ladder on the left side leading to the exit on the left. Pass through to reach room 1E. This pivotal room not only leads to every other section of the Swamp Palace, it also contains the large treasure chest. Since you are not equipped with the large key when you first arrive, you'll have to hunt it down before you can reveal its contents. To get around, you'll have to explore the lower canal. In addition to groups of Hobas and Kyamerons, there is a diving water monster called Pelogoose that drops out pipes in the walls and swims in a straight direction through the water. You'll want to pass through the bottom door first to room 1F in order to collect the compass. When you return, pass through the door on the lower left to room 1H. When you collect a key, you'll need to return here and enter through the locked door in the upper left to room 1L. When you finally collect the Big Key, you will return to this room to open the large treasure chest in the center, where you will find the Hookshot. Learning how to use the Hookshot to maneuver through the dungeons is essential. And in order to escape from this room through the north door, you will have to aim the hookshot at the skull that is visible to the right. If you hit, you will be pulled over to the left island, where a key can be found under the far skull. Return to the chest island, and fire your hookshot at one of the skulls on the top island to pull yourself over there. Unlock the door and proceed to room 1M. There is a Kyameron and a stream of Pelogoose. Going left won't get you very far, so head right, and pass through the door to room 1G. It is a vertical mirror image of the previous room except you can continue all the way around to the left door, through which you can re-enter 1F. Now that you're on the left side, you can finally reach that treasure chest. Open it to obtain the Compass. Now you can push the lower block to the right and exit through the top door back to room 1E. When you first enter the room, you will face another crowd of various monsters. 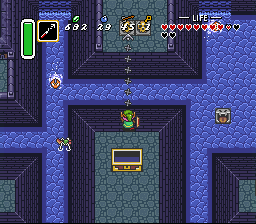 Two Stalfos, a red one and a blue one, are accompanied by a blue Bari, and a fire chain Winder, not to mention the fireball trap. Do your best to breeze past them all to the ladder. Climb down the ladder and run through the top door to 1L in order to grab a small key. Once you've used the key to return to room 1L from room 1E, and pushed the water lever, you will return here. Run back to the ladder and jump in the water in order to swim over the unmovable blocks on the floor. On the other side, a Zol will be guarding a skull that contains a small heart. Pass through the door on the left to room 1J. This room also contains a variety of elements, none of which will be new to you. The alcoves at the top of the room may seem inaccessible to you at first, but you'll soon discover how to reach them. For now, climb down the ladder into the shallow water. Unlike the previous room, all of the blocks down here can be moved. Try pushing the bottom block left, and the middle block up in order to pass. Climb up the ladder and make your way past the Zol to the stairwell that leads to room 1K. When you fall from the left hole in the floor of 1K, you will find a treasure chest that contains nothing more than a red Rupee. However, if you fell through the right hole, you will land on the right alcove which has a door at the end which you can only reach if the Crystal Switch is set with the blue blocks up and the orange blocks down. You'll have to fix the switch if you failed to reset it. Pass through the door to reach the west wing of 1L. This room is big, but there's actually not much to explore. There are Hobas and Kyamerons, a large fire bar in the middle, and a different kind of fireball trap. All of the blocks in the room can be moved, including the two that block holes. While falling through the left hole is entirely optional, falling through the right hole is necessary to complete the dungeon. Falling through either hole will drop you down on to either alcove in room 1J. If you entered this room from room 1H below, you can lift the skull and obtain a Small Key. You're going to use that key to return to room 1E through room 1H, and open the locked door in the upper right corner, which will actually bring you back to the east wing of this room. 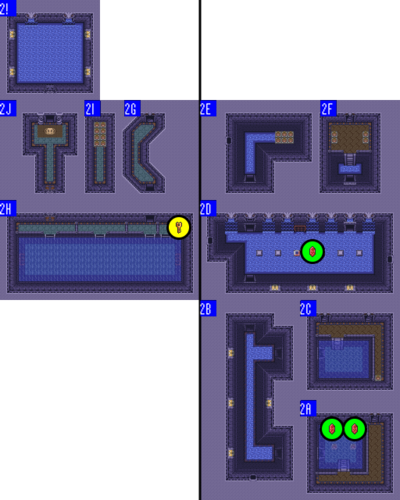 Here, you will find a blue Stalfos, a red Bari, a spike trap, a Crystal Switch, and another water lever. That's quite a lot to deal with, so remove the red Bari and the blue Stalfos as soon as you can. The lever will be behind a fence of blue blocks. Obviously you need to hit the switch to lower them, but it too is behind the blocks. Fortunately, it's not so far away that you can't still strike it with your sword. The blocks will lower and you can push the lever to the right, causing water to flow into the room below. With the blue fence down, you could return to 1H through the south door, but this will cause problems for you later on. You should reset the Crystal Switch so that the blue blocks are up before you leave. You will end up back here when you come through the left door from room 1J. Your final objective in this room, is to open the treasure chest and finally obtain the Big Key. As a bonus, the skulls here all contain blue Rupees. Now you can return all the way to room 1E and open the large treasure chest. In additional to the variety of monsters present in the room, there are a couple of choices for exits. If you head down the stairwell on the right too early, you will find that room 2A is flooded and you won't be able to do much there. The remaining two doors are shut tight, and defeating the monsters won't release them. 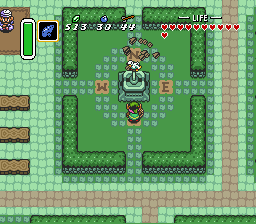 Underneath the upper left skull is a pressure plate, and the statue closest to it can be moved. If you place the statue on top of the pressure plate, the shutter doors will open. While you can proceed through the left door to room 1O, the more productive route is through the right door to room 1P. 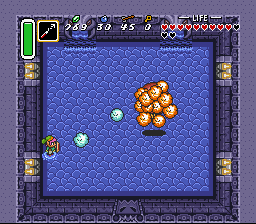 Two Stalfos and a Bari can be found among the fireball traps and skulls in the room. This room merely serves as an entrance way to the left portion of room 1P. Both portions of this room lead you to stairwells that arrive in room 2C. If you arrived here from room 1M, you will be in the right portion, which contains a Red Bari. Note that if you attack the Baris with the Hookshot, you cannot be electrocuted. Taking the right stairwell from this room puts you on the right side of room 2C. Taking the left stairwell, by entering the room through room 1O, puts you on the left side of room 2C. If you haven't pushed the water lever in 2C yet, it will do you no good to end up on the left side, so make sure you enter from the right. If you enter this room from room 1M before you've had a chance to push the water lever in room 2C and drain the water, you won't be able to do much here. 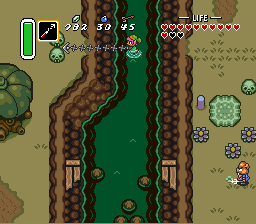 Once the water is drained, you can occupy the lower level and open the two treasure chests to find red Rupees in each of them. Ultimately, you will wish to enter room 2B. Once the water is drained from from room 2C, this room merely serves as a passageway between rooms 2A, 2C, and 2D. Beware of the Hobas and Kyamerons and the Pelogoose that drops out of the pipes. If you first arrive in this room from the left stairwell, you will have to retrace your steps. You cannot squeeze by the lever when it's in its lowered position. Enter the room from the right stairwell, accessible only from the right portion of room 1P, and you can push the lever to the right which drains the water out of the second floor basement, making the remainder of the dungeon accessible. Now you can reach room 2D by way of room 2B. There are more Hobas, Kyamerons, and Pelogoose to deal with now. 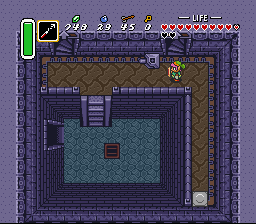 The block that lies below the red grate can be pushed to expose a treasure chest which contains a red Rupee. The exposed doorway along the top wall leads to room 2E, but there is another, more-hidden doorway along this wall. The waterfall which is second from the right hides another entrance which you can walk through in order to reach room 2F. This room is a dead end, but it contains a number of skulls that supply you with bombs, arrows, and Rupees, so it's worth investigating. Once you pass through the door obscured by the waterfall, you will find a room with a ladder that leads to a staircase. There are two blue Baris to watch out for, but nothing else. The skulls on the left contain small hearts with which you can refill your life. Climb the staircase to reach room 2G. This short corridor contains two Zols and a Bari. You can dash through each of them and exit the bottom door to reach room 2H. When you arrive in this room, it should be flooded with water. There are four cropped ladders extending into the pool. When you arrive from 2G, you will be dropping down the second ladder from the right. Swim against the left-flowing current to the right-most ladder and lift the skull in order to find a Small Key. The second ladder from the left leads to a damaged wall which you can bomb in order to expose the opening to room 2I. The left-most ladder leads to a locked door which you need the key you just collected to open. Unlock the door and proceed to room 2J. This room is purely a bonus room that provides you with skulls that contain health, magic, bombs, and arrows. This is final room before the boss fight. Prepare yourself and enter the top door. To defeat this blob of orbiting balls, you'll need your newly-acquired Hookshot. With the Hookshot equipped, you must fire it up at the mass, plucking one ball at a time off of Arrghus' body. When each ball is pulled, begin to attack it with your sword. After a few hits, it will be destroyed. If, for some reason, you do not completely destroy it in time, the ball will float back to Arrghus, and you will have to pluck it off again in order to continue attacking it. Keep this strategy up until every single ball that floats around Arrghus is destroyed. Once the last ball is defeated (there are thirteen), Arrghus is revealed as a red eyeball with tentacles. Arrghus likes to jump up in the air and try to slam down on you. After he lands, he bounces around the room in an effort to collide with you. Slashing his eye with you sword causes him to stop, jump up in the air, and repeat the process. Continue to hit him with your sword until his life is depleted. He will explode, revealing a Heart Container for you to collect as your own. After you collect the heart, the second maiden crystal will be revealed. The second maiden will reveal a bit more of the misery that befell the Golden Land when Ganon stumbled upon its location, but could not figure out how to return to the Light World. She also informs you about the warps that allow you to pass from various parts of the Light World into the Dark World, which you will need to utilize in order to uncover all of the Dark World's secrets. 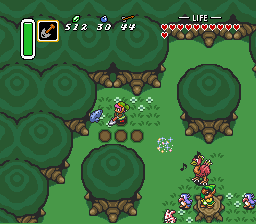 The third crystal appears to lie in the region that equates to the Lost Woods in the Light World, a region known in the Dark World as the Skull Woods. This page was last edited on 4 October 2013, at 03:46. This page has been accessed 142,430 times.